Winnipeg will see temperatures plummet well below seasonal for Thursday, but the cold conditions won’t last long. An advancing cold front will bring cloudy skies with periods of light snow to Winnipeg today. Accumulations will be minimal but don’t let that fool you: this system will pack a punch. Temperatures will reach a high near -9°C this morning, but midday the cold front will slide through and shift the winds northwesterly. Winds will strengthen through the afternoon to around 30 gusting 50 km/h, ushering in a markedly colder air mass. Temperatures will fall to around -11°C by the evening, and then continue to a low near -25 or -26°C. While this is unseasonably cold, it won’t be anywhere near the record low which sits in the -30s. Skies will clear out in the evening alongside diminishing winds. Fortunately, the cold will be short-lived. Thursday will see a daytime high colder than the seasonal overnight low as temperatures climb back to around -17°C. Winds will remain light and gradually shift to southerly as an Arctic high passes through the region into the Dakotas. The core of the cold air will already be to our east by Thursday night, with warmer air quickly moving in behind it. As a result, the city will see some cloudiness on Thursday night with temperatures remaining fairly steady near -17 or -18°C. 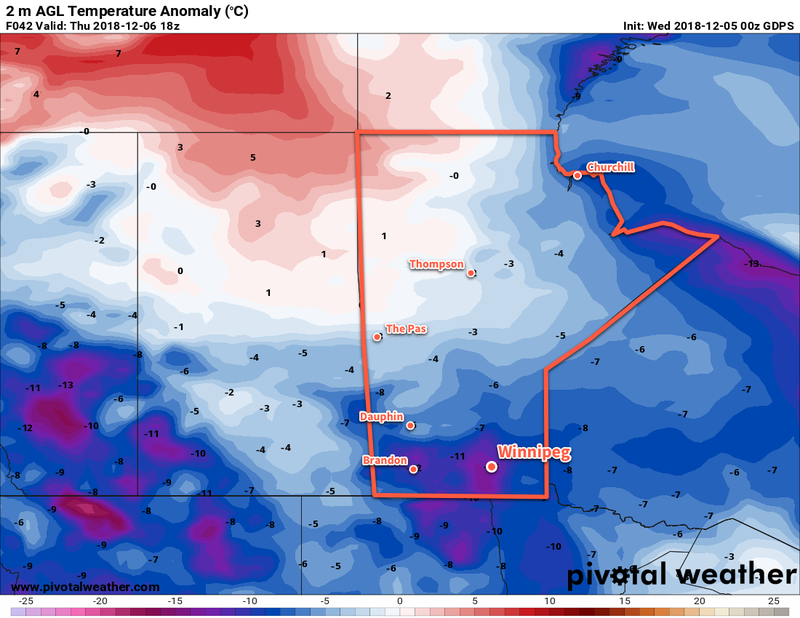 This forecast of temperature departures from seasonal show the core of the coldest air over southern Manitoba midday Thursday. Note, however, the flood of warmer temperatures quickly spreading back into the Northern Prairies in its wake. Friday will bring more sunshine as temperatures continue to climb back towards seasonal. Winnipeg will see a high near -11°C with light southerly winds continuing. Temperatures will dip to a low near -15°C on Friday night with a few clouds. The city should see near-seasonal temperatures through the weekend with a fair amount of sunshine. Seasonal to above-seasonal temperatures look likely to start next week, but cloud and the chance for more flurries or light snow may return midweek into the weekend. Winnipeg’s seasonal daytime high is currently -8°C while the seasonal overnight low is -17°C.